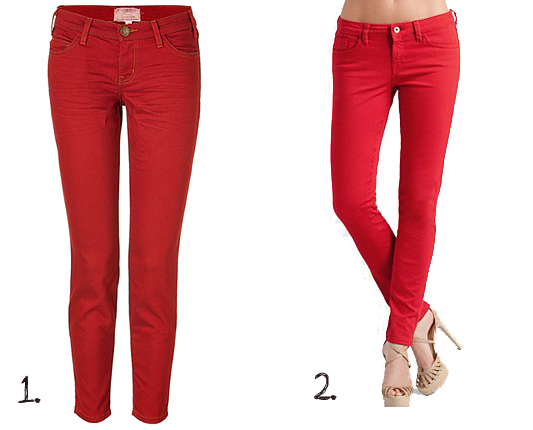 I've been seeing a lot of this 'red-jeans-trend' lately, and I have to admit I'm really tempted to go and buy a pair for myself. A pair of red jeans seems to be a must-have this season, a lot of celebrities rock them with different styles, looking fabulous - of course. That's the problem, because I'm a bit scared to wear red as I'm not exactly a super model and there are certain looks that are quite difficult to pull off. But I've seen a couple of jeans which may be the perfect shade and shape for me. Those in the picture are from 1.Current Elliott and 2. Guess. I think I could try and dress them up with some lace tops or just go for a simple casual look, paring them with a plain white t-shirt or a tanktop. Sadly, I don't have the money to go for either of them right now, but they go in my wishlist,for sure!